Visitors and guests to the Club should be aware of the following dress code guidelines in effect at the Peterborough Golf and Country Club. Hats are not to be worn in the Dining Room or Lounges or anywhere in the Clubhouse where food is served. Hats, caps/visors may be worn while traveling between the locker rooms and the golf course or the curling rink. 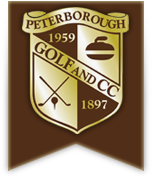 Peterborough Golf and Country Club is an established Club with a dress code that is set to reflect the stature of the Club and its traditional style. In order to avoid embarrassment and ensure a pleasant visit, all Members should be aware of our standards of dress and should inform their guests of these standards. Dining Room: The dress code for the dining Room is smart casual attire and/or smart casual denim. Jeans and denim must be clean, in good repair, no rips, tears, frayed ends or holes and must fit appropriately (no excessive baggy denim). Smart casual does not include yoga wear, running wear, track suits or similar athletic attire. Cargo pants are not permitted. Tops with commercial/promotional logos or names must be in good taste. Tank tops, T-shirts, crop tops (no bare midriffs), hoodies are not acceptable. Dress shorts are allowed during the golf season. Centennial & Curling Lounges: The dress code for the Centennial and Curling Lounge is the same as above. Hats: Caps or visors may not be worn backwards and hats are to be removed when in the Clubhouse. Men’s Shirts: Shirts must be tucked in at all times and have a collar. A ‘collar’ can be the traditional style, turtleneck style or the mock neck style. Ladies Shirts: Sleeveless tops are permitted provided they have a collar and conversely, any top that does not have a collar must have sleeves. Tops must be worn tucked in, unless designed to be worn out. T-shirts, halter-tops, tube tops, crop tops and tank tops are not permitted. Ladies Pants/Shorts: Dress skorts, shorts, Capri pants and slacks may be worn. Appropriate length is five inches or less above the knee. Spandex shorts, cargo shorts and denim shorts or pants of any colour are not acceptable attire. Shoes: Appropriate golf course footwear must be worn. Shoes/golf sandals must be equipped with non-metal spikes. Soft-soled shoes are permitted. It is in all our interests to maintain reasonable standards of dress in keeping with a Club of Peterborough Golf and Country Club’s status.